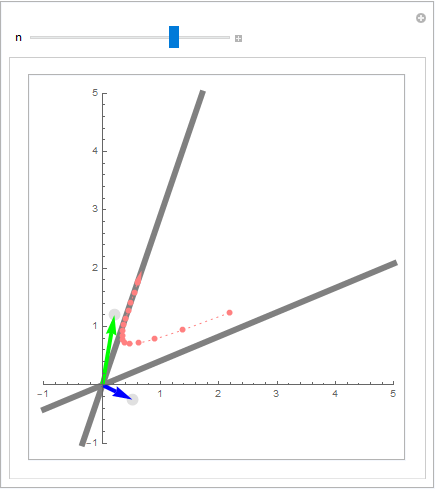 I've recently stumbled upon this very nice interactive visualization of eigenvectors of two-dimensional matrices, and how powers $A^k$ act on various vectors. 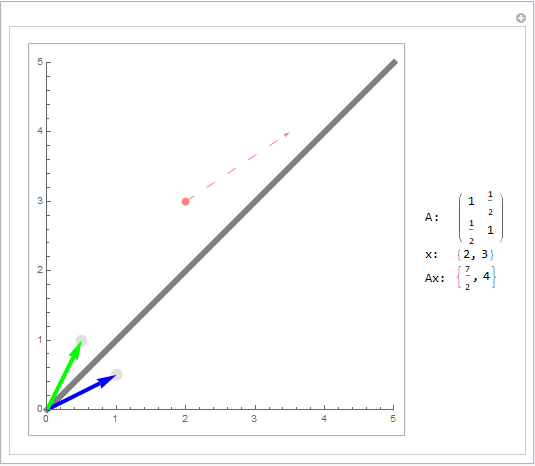 How can this sort of visualization be realized with Mathematica, leveraging its dynamical capabilities? The following is an attempt to recreate a similar sort of interactive visualization, showing the eigenvectors (when real), and how the various points of the unit circle are transformed by the matrix. The matrix can be chosen by moving its two column vectors using the mouse. I used EventHandler for this, instead of Locators, for greater customizability and a more natural look. To ease code readability and modularity, the components of the graphical object are defined separately in a private context, and injected into the final DynamicModule object. 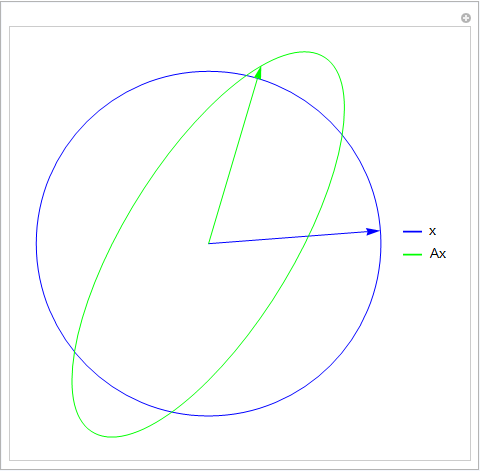 Here, the blue arrow corresponds to a unit vector (which traces out a circle), and the green arrow corresponds to the transformed unit vector (which traces out an ellipse). If you can make the blue and green arrows parallel to each other, then the green arrow corresponds to an eigenvector of A. The slider for n determines how many iterates of $\mathbf A^n\mathbf x$ to take. Not the answer you're looking for? Browse other questions tagged graphics dynamic linear-algebra visualization eigenvalues or ask your own question. 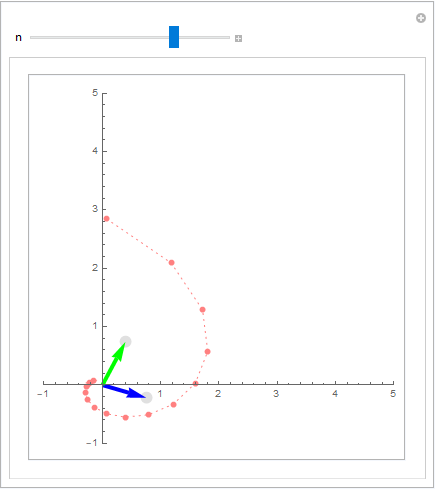 How to translate interactive graphics from Mathematica to standard HTML+SVG? Why can I edit only one character of the output of a Dynamic expression? What if do NOT want Mathematica to normalize eigenvectors with Eigenvectors[N[matrix]]?